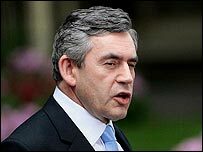 Prime Minister Gordon Brown will oppose an above inflation pay rise for MPs, according to Downing Street sources. Reports suggest the Senior Salaries Review body has recommended a rise of nearly 1% above inflation. Mr Brown is said to oppose this, but some MPs say their pay has fallen behind. MPs will have the final say in the Commons. Glyn Travis, of the Prison Officers Association, said such a pay rise would be outrageous. He told BBC Radio Four's The World at One: "Public sector workers pay has fallen behind since 2001, way before MPs have alleged that their pay had fallen behind similar workers. "What the MPs need to do is look at the public sector workforce and see what sort of pay they're getting for the jobs they do." The prime minister has urged pay restraint across the public sector. The findings of the Senior Salaries Review Body, the independent body which makes pay recommendations for MPs, have not yet been made public. However, leaked reports suggesting a 2.8% increase in April, and further increases amounting to nearly 10% over three years, were described as "broadly accurate" by a Downing Street source. The source went on to say that Gordon Brown would oppose such a rise - although the ultimate say goes to MPs. They will have a free vote in the Commons on the issue. But Labour backbencher John Spellar suggested MPs were more deserving of the recommendation. He told the BBC MPs pay had fallen behind equivalent earnings and also inflation in recent years. And Stephen Pound, Labour MP for Ealing North, said MPs deserved the award. "I would like there to be just some fairness and some sort of reasonable attitude instead of everybody coming out of the woodwork and saying, if MPs want to have a two-and-a-half per cent, they've got their snouts in the trough," he said. Mr Pound went on: "I've never ever, in the time I've been an MP, done less than a 14-hour day. I think we work pretty damn hard for what we get." BBC Political Correspondent Reeta Chakrabarti outlined Mr Brown's stance, as well as the likely reasons behind his position. Our correspondent said: "With the police up in arms over their 1.9% pay deal, the last thing the prime minister wants is for MPs to be seen awarding themselves an over-generous rise." She added that, according to Downing Street sources, Mr Brown is "opposed to this - MPs have to set an example and they have to live in the real world."